The Cannonball Trail, located in Ringwood Manor State Park,it follows the route of the historic Cannonball Road. This road was built by the Patriots during the Revolutionary War to transport munitions without being intercepted by the British. The historic Cannonball Trail is part of the The History of The Glen Trail which travels for 9.8 miles around 800 acres of Camp Glen Gray and the Ramapo Mountains. 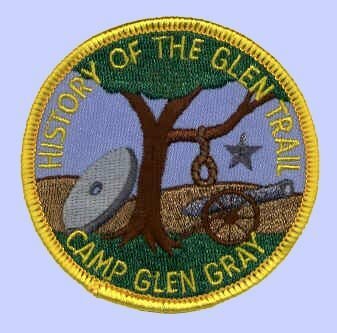 While hiking the Glen Trail route, you will visit and read about the millstones, the Cannonball trail, charcoal production, iron mining, the people who lived here and the rich history of Camp Glen Gray. You will have views of New York City, the Catskill Mountains, Wanaque Reservoir and western New Jersey. History of the Glen Trail awards patches can be purchased at the Camp Glen Gray Trading Post. No parking permitted for hiking at the Camp, only campers and through hikers allowed. The cache is located right off the Cannonball trail, not far from Matapan Rock scenic overlook. Parking area / Trail Head off Skyline Drive. N41.03.585,W74.15.039. These trails are also part of The (8) Hiker Series caches by BrianSnat. This is a beautiful area and an excellent hike. Zrqvhz obhyqre - 3 srrg sebz bnx gerr. Ybpx naq Ybpx pbagnvare.